Before opening at the Grand Palais on 22 February of next year, Turner and the Masters has welcomed its first visitors, both numerous and enthusiastic, in London. This is due reward for a presentation which associates texts and images in such a precise manner that there is no need for lengthy explanations to understand the curators’ message. Yet the intention far surpasses the pleasure of seeing Turner next to his acknowledged models or the goal of showing us how earnestly and constantly he turned to them. Appropriating the grand masters was an obvious choice for this young London painter (1775-1851), especially as he was quickly put to work, much like Ingres at that same time. Learning methods were very similar on both sides of the Channel in the late 18th century, as was the drive to continue benefiting from more tried formulas. The son of a barber, Turner was 15 years old when he exhibited for the first time inside the Royal Academy, traditionally more associated with the art market than the Salon in Paris. He had started his education very early, copying engravings or paintings seen in the homes of his patrons or collectors where he had an open field, ranging from Rembrandt to Piranesi. The leading artists of British landscape painting of the 1790’s also caught his attention naturally, foremost of them Richard Wilson. Much in fashion, the latter was considered the English Claude, even more poetic than his Lorraine counterpart. The emulation he inspired in Turner resulted in beautiful examples shown here, proof that the young student quickly learned to impart more power to his space and more intensity to his light. In fact, a characteristic of his personality is that he was not misled by what he saw. 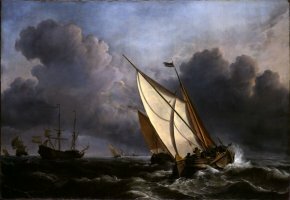 From Van de Velde the Younger’s (ill. 1) seascapes, in a genre which was as profitable as Italianizing pastoral scenes, he lost no time in mastering the formulas, the stormy skies, the electrically-charged lighting and the drama on the high seas. But, here again, Turner goes further in bravado (ill. 2), shows more genius by nature and is more metaphysical instinctively in a shipwreck’s devastation, with the painting itself resulting in deliberate and controlled chaos. A bit farther on, other rooms confirm that nothing resisted his talent, Canaletto’s Venice or Loutherbourg’s fires. Of course, the open competition with the masters responded also to the market, especially early on in Turner’s career. Part of his clientele, unable to afford the originals, found the charm of great paintings at the right price in his productions. Only later would the signature of this ingenious copyist be sought after in its own right. A whole section focuses on references to Northern painting, corresponding to the strong demand. This motivated Turner to follow Cuyp, Teniers or their English disciples. Wilkie, the most famous and popular of his contemporaries, had made the smoking scenes and the rowdy groups of the Flemish painter a national art. The exhibition does not overlook Turner’s very early ambition, reflecting the need for diversity, to put himself on a level with the loftiest genre in the hierarchy of art, as seen in his sketchbooks containing studies after the old masters of historical painting. Those he produced at the Louvre, of the peace treaty in Amiens, are well known, from Titian and Poussin to Guérin, a titan during the Consulate along with Gros and Girodet. The idea of associating Watteau to his ideal museum is an excellent idea here as well. Turner idolized this painter of “fêtes galantes”, a little-known fact. It seems that he confided to Reverend William Kingsley that “he had learned more from the French painter than from any other”. Watteau is like Rembrandt in a more evanescent manner, attaining reddish browns of extreme fluidity. Among those artists who Turner illustrated after “plundering”, the painter of Cythera stands out significantly. The strange and beautiful painting he presented at the Royal Academy in 1831, no doubt influenced by Bonington, showed Watteau in his Workshop, while alluding at the same time to De Arte Graphica by Charles Alphonse du Fresnoy. A passage from this 17th century treatise was reproduced in the exhibition leaflet, emphasizing the science of white as detailed by the theoretician and the true colourists who came after him… Turner was aware of the importance of the legacies he had received and wished to prepare his. Not long before dying, he carefully donated part of his workshop to the Crown of England and notably his variations on Claude, on condition however that the National Gallery respect with the hang the filiation leading from one to the other. Mission accomplished. Today, it is there for all to see. 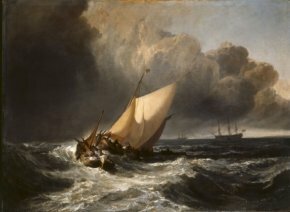 A whole century, give or take a year or two, separated the young Turner from Claude’s death, a century which exerted a nostalgia to revisit Arcardia on the British painter. Turner said it himself in 1811 : “Pure as the Italian air, calm, beautiful and serene, the work springs forth and with it the name of Claude Lorrain”. He loved and defied this light with which he imbued his ports, his ruins, his large trees, an epic sweep of immediate impact evoking a dream-like nature, at times, but not always, made even more profound by a subject. The rage for Claude was such in England between 1760-1820 that Turner could not avoid him. He was to take this vogue for Claude to the mysterious abstraction of his studies of the sky, to his metaphysical fog where forms are no longer identifiable in a divine atmosphere. Turner and the Masters, goes well beyond, as we can see, the simple and reassuring comparison to four or five giants of European painting. Visitor information : Tate Britain, Milbank, London. Tel : +44(0) 20 7887 8888. Open every day from 10h to 17h40. Rates : 14€.